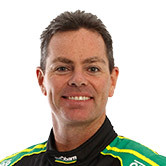 It could be the lap that breaks Craig Lowndes' bid to win the 2014 V8 Supercars Championship. Four different contacts on the opening lap of race 20 at Reid Park ultimately ended with the Red Bull Racing ace's Holden Commodore VF embedded in the tyre wall and no points added to his driver's championship tally. The immediate impact was his drop from second to third in the championship behind leader Mark Winterbottom and race winner Jamie Whincup, his RBRA team-mate. The good news was that the #888 looked likely to make it onto the grid for race 21. The hits started with the Holden Racing Team's Garth Tander in and out of turn one, continued with HRT's James Courtney in turn 11 and then finished parked the wrong way in the pitlane entry after being rear-ended by Erebus Motorsport's Will Davison. "I don't know what was going on!" said Lowndes, who started from fifth grid position. "We got a ripper start, went down the outside of Scotty (McLaughlin) down into one. We had a little contact, I think it was on Garth. We got around the corner and Jason Bright was on my right and Garth was on my left and I was the meat in the sandwich. "Then I stayed out of the next one which I think was Brighty and Courtney, who tagged the wall coming out of three. "I think after that Courtney might have had a damaged left rear, because he was struggling with it. I had a good run down into 11, lost the rear a little bit, had a bit of contact, got around and then there was contact and I went around. "I slapped the wall on the pit entry and that was the damage done." A broken rear toe-link was repaired but the bent steering wasn't before Lowndes went back out with the intention of completing enough laps to collect a few points toward the championship. But it wasn't to be, the steering breaking and the car ploughing into the tyre wall at turn five on the out lap. "As I went over the crest at four and went to turn into five and the thing just went straight. It broke the front and I ended up under the tyres," Lowndes said. Lowndes played down the violence of the incident. "It was a four (out of 10). Because the car buried under the tyres and the tyre bundles came up to me, it slowed the car down really quickly." Lowndes, who was cleared of any injury, is scheduled to start sixth in race 21.